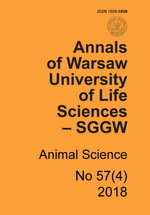 Annals of Warsaw University of Life Sciences were originally published in 1957 as Zeszyty Naukowe SGGW (Scientific Fascicles of SGGW). 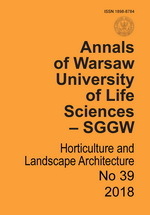 In 1980 the name was changed to Annals of Warsaw University of Life Sciences. 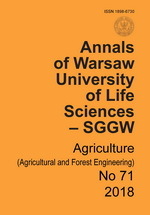 The Annals (7 subject series) are published once or twice a year and will carry previously unpublished papers that are mainly in English, but also in French, German or Russian, followed by a short summary in Polish. Manuscripts for publication should be typewritten and submitted to the Warsaw University of Life Sciences Press in two copies. Papers submitted for considerationn by the Editorial board should not exceed 0.5 of a printed sheet (about 11 pages including illustrations, and should consist of the following elements: 1) name and surname of the author, 2) title of the paper, 3) abstract (about 20 lines), 4) text of the paper, 5) date when the paper was sent to the Warsaw University of Life Sciences Press and mailing address of the author, 6) summary (one page), 7) tables and figures with captions. Authors receive twenty five offprints free of change. 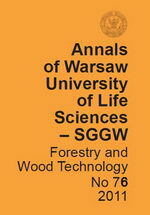 The Annals of Warsaw University of Life Sciences - SGGW has implemented the procedure to prevent cases of ghostwriting. To avoid cases of ghostwriting the Editors request information about the contributions of each author to a submitted study. The Editors consider authorship to include all of the following: 1) substantial contributions to conception and design, acquisition of data, or analysis and interpretation of data; 2) drafting the article or revising it critically for important intellectual content; and 3) final approval of the version to be published. Authors should meet conditions 1, 2, and 3. The Editors also request that one author, referred to as corresponding author / guarantor, be identified as the person who take responsibility for the integrity of the work as a whole and for the presence and order of co-authors. Ghostwriting is considered academic dishonesty. All detected cases of ghostwriting will be exposed by the Editors, including notification of institutions employing the authors, scientific societies, associations of science editors, etc. All cases of scientific misconduct (particularly violations of ethical standards applicable in science) will be documented. 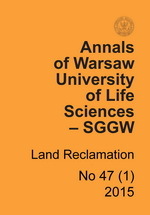 Annals of Warsaw University of Life Sciences is covered by Polish Scientific Journals Contents - Life Sciences, AGRICOLA, AGRO and indexed by Index Copernicus.